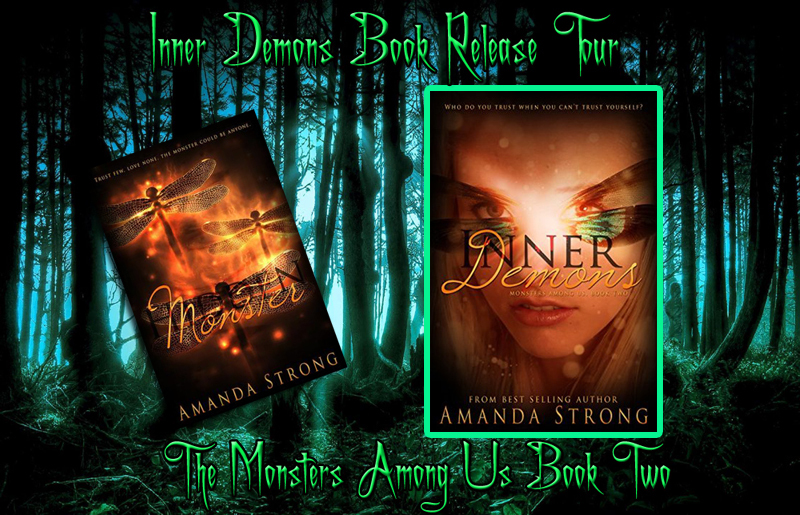 Clean Teen Publishing is excited to present Inner Demons the latest installment in Amanda Strong’s The Monsters Among Us Series. The images I’d conjured of an actual prison cell were nothing like what I found Mack in. The cot bed and plain chair gave it more of mental hospital feeling than a jail. The restroom was down the hall. According to the guard, that was the only time Mack would leave his holding cell. The door was shut, but through the rectangular glass window, I got a clear view of Mack as we approached. My stomach clenched. With his spiky hair turned into a shaggy mess and no glasses, I hardly recognized him. He leaned against the wall, where the headboard would’ve been if the bed had a frame. He didn’t notice us until Blake opened the door, glancing first at Blake and then me. His eyes widened and he jumped to his feet, running his hands up and down his face before putting his glasses back on. In that moment, I had to resist the urge to make a spectacle of myself. I wanted to hurl myself past Blake and throw my arms around Mack. Everything about this felt wrong. His eyes widened even further as I drew close. “Okay, thanks,” I said, surprised he seemed to know what I needed right then. I turned to Mack as the door clicked behind Blake. We were alone. Maybe now he’ll stop frowning. Instead, Mack sat back down on his bed, his face contorting into a grimace. It was so unlike the Mack I knew. “Hey, I come all this way to see you and this is how you treat me?” I asked, trying to make light of the situation. I let the name slide. Mack had been calling me that for so long, I wondered if he even noticed the difference anymore. He glanced away from me and shook his head. For seventeen-year-old Samantha Campbell, running back woods trails usually means freedom from her less-than-perfect life. That is, until the day a morning run turns into a living nightmare. When Samantha wakes up to find herself bound to a dirty, pinstriped mattress, she realizes she’s anything but free. With a masked abductor repeatedly injecting her arm with an unknown substance while holding her captive, Samantha tries in vain to find out what he wants, but he refuses to speak. Until the day he breaks his silence and his twisted words are worse than what she’d imagined. He promises her one day she will fall in love with him but the best part will be that she won't know who he is... until it's too late. Born in Dekalb, Illinois, Amanda Strong has called Utah, Arizona, Hawaii, Virginia and now New Mexico home. Amanda has loved to spin tales since childhood. It was not uncommon to find her hiding in some random corner, scribbling away in her spiral bound notebook, with her bright pink glasses. You could say some things have not changed. Amanda signed with Clean Teen Publishing in the fall of 2013. Her first novel, The Awakener, book one in a young adult paranormal romance series called: the Watchers of Men, came out in October of 2013. She is currently working on book two, The Holy and The Fallen, expected to come out in the early part of 2015. Amanda’s newest creation, Hidden Monster, released November 4th of 2014, and finished as a Finalist in the 2014 USA Best Book Award: Young Adult Category. It is book one of a brand-new a young adult, sci-fi thriller series called Monsters Among Us. When Amanda isn't writing, you can find her chasing her three rambunctious children around the house and spending time with her wonderful and supportive husband. On some occasions you can still find Amanda with her not-so-pink glasses, hiding in a corner reading her favorite young adult fantasy novels or working out only to blow her diet by eating ice cream. CTP is awesome! 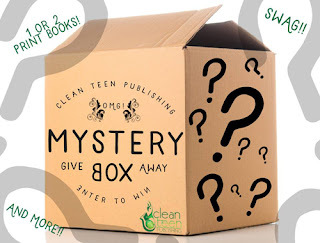 They give away a mystery box every week 😀 It’s usually got some book swag and books so it’s great!